I want to thank my cousin Arthur “Pete” Scott for all his help with finding newspaper clippings (including some of the ones appearing in this post) and other information to try and fill in the timeline for Bernard and the other Seligmans. He has also contributed a great deal of information about our family at http://www.vocesdesantafe.org/social/index.php/homepage Like my father, Pete is a great-grandson of Bernard Seligman and thus my second cousin once removed. 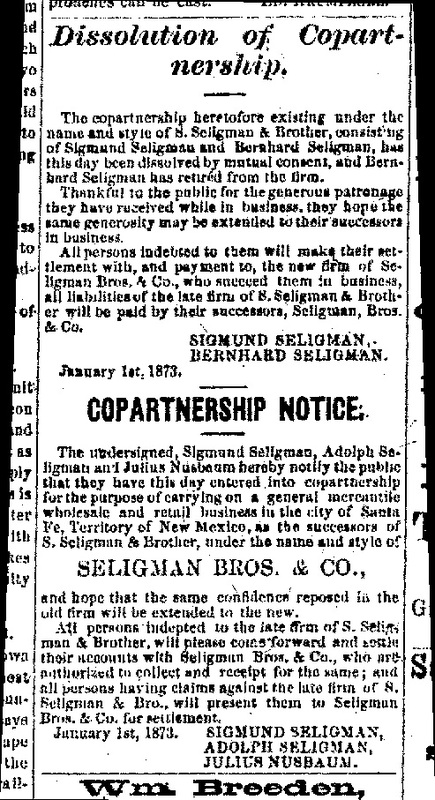 The firm of S. Seligman and Brother was dissolved, and a new firm owned by Sigmund and Adolph Seligman and Julius Nusbaum was created named Seligman Bros. and Company. Who was Julius Nusbaum? He was Bernard’s brother-in-law, the brother of Frances Nusbaum, Bernard’s wife. I cannot find an explanation for Bernard’s withdrawal, and he certainly was involved in the business again in later years. He had applied for a passport on April 3, 1873, and he served as a representative to the Vienna Exposition of 1873, so maybe that prompted his withdrawal. Maybe it’s my modern skepticism that is coloring my perception, but it also seems possible that Bernard withdrew only in name, placing his wife’s brother in the firm in his stead. Was this done for political purposes to avoid at least the appearance of any conflicts of interest? Henry Tobias, author of The History of the Jews of New Mexico (University of New Mexico Press, 1990), writing about New Mexico in the 1880s and 1890s, described Bernard Seligman as “probably the most political of all the Santa Fe Jews” during that era (Tobias, p. 117). Ralph Emerson Twitchell, author of Old Santa Fe: The Story of New Mexico’s Ancient Capital (Rio Grande Press, 1925), wrote, “A public speaker of great force and convincing power, [Bernard Seligman] found time to engage in the public affairs of the country of his adoption and was elected and appointed to many positions of profit and trust.” (Twitchell, p. 477) Twitchell also pointed out that Bernard “was a linguist of rare ability; speaking with fluency the English, German, French, Spanish, Italian, and Hebrew idioms.” (Ibid.) Bernard must have been well suited for a career in politics and government in bilingual New Mexico. Tobias wrote that Bernard became a member of the territorial legislature in 1880. (Tobias, p. 117) Both Bernard’s obituary (“A Good and True Man called Home,” Santa Fe New Mexican, February 3, 1903, p. 1) and Twitchell (p. 477 ) also state that Bernard served several terms in the Legislative Assembly for New Mexico. Another source reported that Bernard was instrumental in the passage of the mechanic’s lien law while he served in the territorial government, a law considered to be very important at that time. (George B. Anderson, History of New Mexico: Its Resources and Its People, Vol. 2 (Pacific States Pub. Co. 1907)). Bernard and the Santa Fe County Commission ran into some legal trouble when a local resident and attorney, Thomas Catron, sued the Commission, alleging fraud. Catron claimed that in 1886 the Commission had issued warrants to raise money for a new courthouse that would increase the county debt beyond the limits set by a new federal statute; he alleged that to avoid that new limitation, the Commission had falsely stated the issuance date of the warrants so that they predated the effective date of that new law. Bernard Seligman is named in the case as the chair of the Commission at the time of this alleged fraud. The Supreme Court of the Territory of New Mexico found that Catron had stated sufficient facts, if proven, to support a claim against the Commission and remanded the case for trial. Unfortunately, I cannot find any report on the final outcome of the case on the merits. Given Bernard’s future political success, perhaps Catron lost the case. Bernard also encountered some controversy when the Governor of the New Mexico Territory, Edmund Ross, named him as his choice to be the treasurer of the territory. 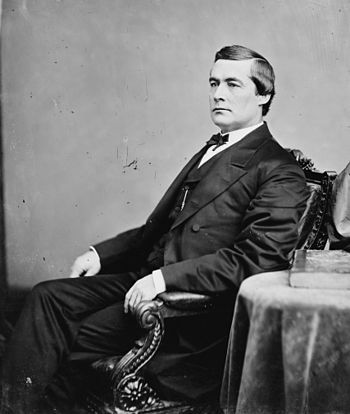 Thomas Catron was again involved in the fight against Bernard. 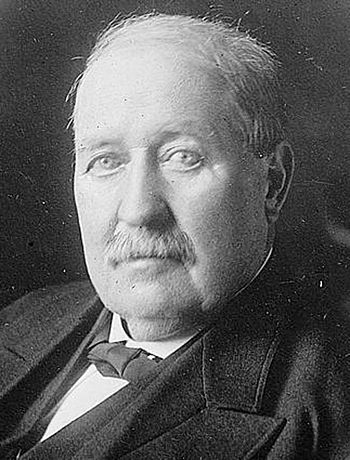 Catron was himself a political leader in New Mexico, having served as Attorney General and US Attorney for the territory and later serving as one of its first US Senators when New Mexico became a state. I am curious about the reference to Bernard as a “medicine man;” I have no idea what it means in this context. Governor Ross did in fact appoint Bernard Seligman to be territorial treasurer, but that appointment was then resisted by a man who claimed to be the sitting treasurer, Antonio Ortiz y Salazar, who refused to turn over his office to Seligman. Ortiz, represented by the same Thomas Catron who was suing Bernard for fraud in his role as County Commissioner, argued that the governor had not had authority to appoint Seligman because there was no vacancy to fill as Ortiz still held the seat and had not resigned or died. Seligman brought a mandamus action against Ortiz, seeking to have him hand over the incidents of the treasurer’s office. Seligman claimed that the oath taken by Ortiz when sworn in for a second term in 1884 was void because of some irregularities. Ortiz responded that he had been properly sworn into office in 1882 for his first term, and thus he still had a valid claim to the treasurer’s office despite the governor’s appointment of Seligman. The trial court judge disagreed and ruled that Seligman’s appointment was valid and that Ortiz had to give up his seat. Ortiz requested a rehearing, and on review, a different judge reversed the first court’s decision and ruled in favor of Ortiz, concluding that the appointment of Seligman as treasurer was not valid because Ortiz still properly held the seat. Perhaps there was prejudice on both sides: anti-Mexican prejudice by Ross and anti-Semitic prejudice on the part of those opposing the appointment of my great-great-grandfather. Several sources, however, state that Bernard Seligman did serve as territorial treasurer: his obituary, Twitchell, and Tobias all refer to the fact that he served as treasurer. The Legislative Blue Book of the Territory of New Mexico (1911) lists Bernard Seligman as territorial treasurer from 1886 through 1891. None of these sources explain, however, what happened that allowed Seligman to continue in office after the court decision in favor of Ortiz in 1889. Meanwhile, at home his children were growing up. In 1881, my great-grandmother Eva, then fifteen years old, left Santa Fe for Philadelphia where she went to Swarthmore and later married my great-grandfather Emanuel Cohen in 1886. Her younger brother James also went to Swarthmore, where he was a member of the class of 1888 and a member of the literary society. Bernard and Frances’ next child, Minnie, also followed in her siblings’ footsteps and enrolled at Swarthmore as did her younger Arthur. Although Arthur was two years younger than Minnie, they both enrolled at Swarthmore the same year—1885-1886. In that year James, Minnie and Arthur were all students at Swarthmore, James a sophomore in the college and Arthur and Minnie as juniors in the preparatory school. I am not sure where Eva was living that year as she appears to have finished her studies at Swarthmore in 1884 and did not marry Emanuel until 1886. With at least three of their children living in Philadelphia and Bernard busy with politics, I wonder whether Frances had also returned to Philadelphia to be closer both to her Nusbaum family and her children and whether Eva was also living with her mother there. Although Eva and Frances are listed on the 1885 New Mexico Territorial Census, so are the other three children, despite the fact that those three were enrolled at school in Philadelphia that same year. The news clipping above reported that Frances had stayed behind in Philadelphia “with friends” in 1889 when Bernard had returned to Santa Fe. The family suffered a tragic loss on January 14, 1887, when Minnie, only seventeen years old, died from meningitis while in Philadelphia. The address on the death certificate was 829 North 5th Street, Philadelphia. 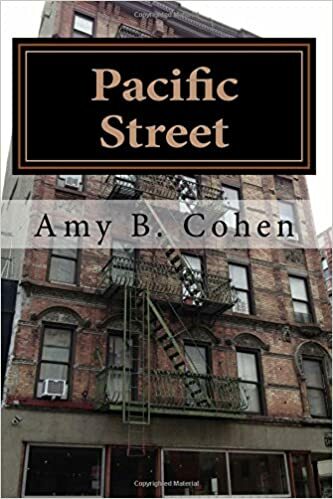 Although I cannot find where the other Nusbaums were living in 1887, earlier Philadelphia directories list several members of the extended Nusbaum family living at residences nearby on North 6th Street and North Marshall Street. 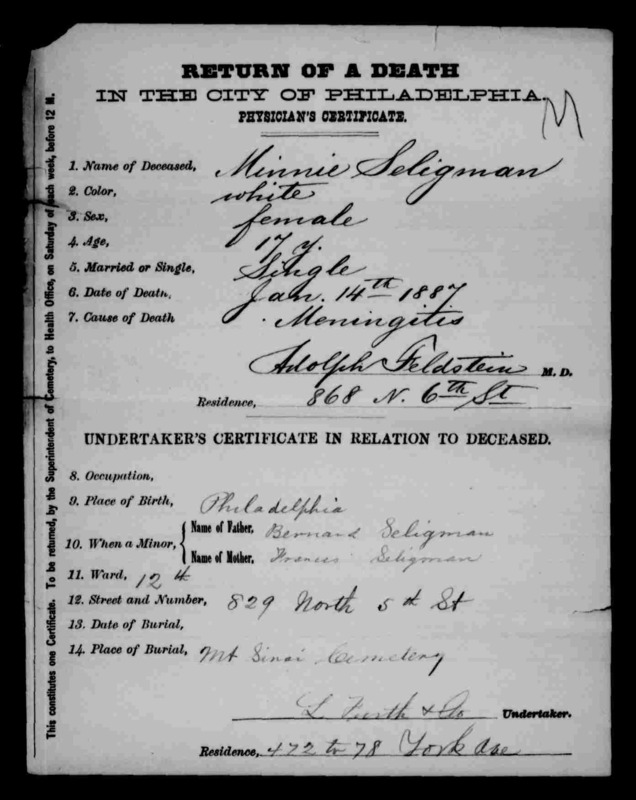 Minnie was buried in Philadelphia at Mt Sinai cemetery, the same cemetery where her infant sister Florence had been buried in 1867 and where her uncle Sigmund Seligman had been buried in 1876 and where her parents and her sister Eva would later be buried. Although the family may have left Philadelphia for Santa Fe almost twenty years before, it is pretty clear to me that the ties back to Philadelphia remained very strong for the family of Bernard Seligman. 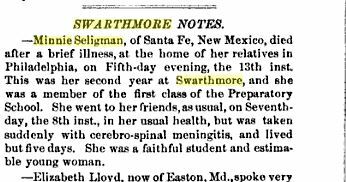 Swarthmore had a preparatory school as well as a college in those days, and my great-grandmother and her siblings all attended the preparatory school and then most attended the college for at least some time as well. 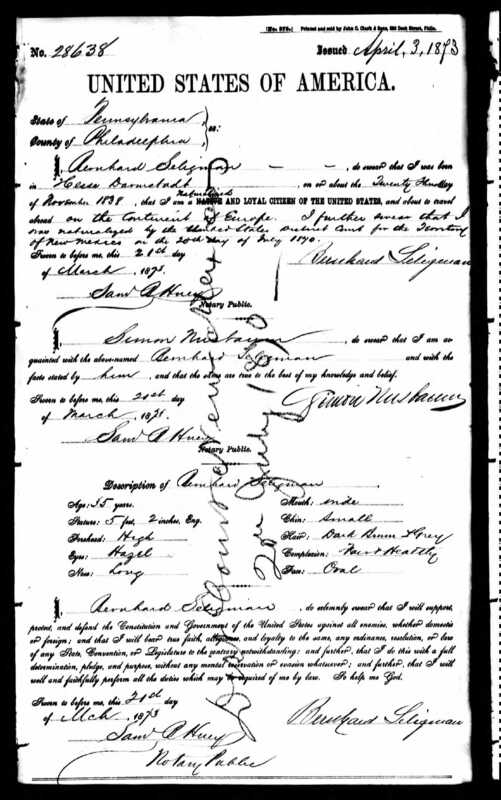 This entry was posted in Genealogy, Philadelphia, Santa Fe, Seligman/Seligmann and tagged Bernard Seligman, genealogy, Germany, New Mexico, New Mexico Territory, Philadelphia, Santa Fe, Santa Fe County New Mexico, Santa Fe New Mexican, seligman by Amy. Bookmark the permalink. Mi prima, you are very welcome and thank you for so meticulously detailing the history of our common ancestors. I would like to add a bit about Catron and New Mexico history. At one time Catron was the largest land owner in the US. What is now NM was taken from Mexico by force in 1846. It was a land that was governed by Spain and later Mexico for about 300 years. During that period there were hundreds of grants of land from the king of Spain and subsequently the Mexican government. Eastern attornys and others used the native ignorance of US law and thee US obligation according to the treaty with Mexico to obtain large land tracts. The early Jewish pioneers of New Mexico were generally not interested in land acquisition so concentrated on other enterprises. Also were, for the large part, Democrats. Thanks so much, Pete, for the additional information. Until I started researching our Seligman relatives, I knew almost nothing about New Mexico’s history. I am very grateful to you for helping me understand its history. Catron sounds like a bit of an opportunist who was, perhaps, a bit envious of our relatives’ success both in business and in politics. The Hispaano community consider him more of a thief than opportunist. Through the years there have been several incidents connected to these land grants. The most famous was Reyas Tijarina’s raid on the district courthouse in Tierra Amrillaa, NM in the 1960’s (I believe.) It resulted in the shooting of a deputy. The sitting judge’s son has written a book recently calling for government repatriation payment to the grantees. I was trying to be subtle! 🙂 Quite ironic that he was the party suing Bernard and the County Commission for fraud….